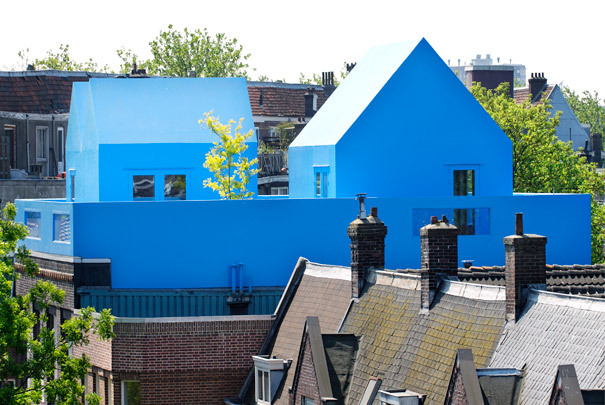 This rooftop extension to a solid brick building consists of a startling blue 'village' of two tiny houses with bedrooms for parents and children. Each 'house' is reached up a spiral stair suspended just above the living room floor below. Their position on the large rectangular roof plane generates a small sequence of outdoor spaces. A wall along the edge of the project has windows in it giving views of the street. Trees, tables, benches and open-air showers complete the roofscape. All elements - houses, surrounding wall, floors, 'street furniture' - have a sky blue polyurethane finish.